Introduction: Hydatid cyst is a parasitic disease caused by Echinococcus granulosus. The liver and lungs are the most frequently involved organs. The treatment of lung hydatid disease is surgery. We aimed to discuss the results of surgically treated patients with pulmonary hydatid cysts in light of the related literature. Materials and Method: 85 patients were divided into two groups as complicated and non-complicated. Patients who had more than one cyst in the same lobe or patients with multiple lung cysts in different locations were excluded in the study. The significance of the results was assessed by Fisher's exact test. P values<0.05 were considered as significant. Findings: While the number of non-complicated patients was 58 (68%), it was 27 (32%) for complicated patients. In the statistical analysis, gender difference was not significant for both groups (p>0.05). Additionally, the disease was not significant in terms of right or left lung location (p>0.05). For both groups, the disease was not significant in terms of the location of lobe. Statistically, gender was found to be not significant on bronchus or pleural expanding (for male p>0.05, for female p>0.05). But, the right lung lesions were found to be significant in terms of the expansion in both bronchus and pleura (p<0.05). Centrally located lesions were found to be statistically significant in terms of bronchial expansion (p<0.05). Discussion: Hydatid disease is particularly common in places where farming is still widespread. We believe that the only treatment method is people's awareness and surgical procedures. Hydatid cyst is a parasitic disease caused by Echinococcus granulosus. Hydatid disease is caused by the metasestod forms of this parasite . Eggs that create the disease are taken when hosts such as dogs, wolfs, jackals and foxes eat the internal organs of temporary hosts including productive echinococcus cysts . Then, these eggs are propagated to the external environment with stool of main host. After spreading eggs are taken by humans with water and food, embryos hatching out of the egg in stomach and duodenum settle in liver, lungs and other organs through the portal vein and lymphatic system. In addition, they cause hydatid cysts by taking the form of larvae in the region they settle . 85-90% of patients have a single organ involvement. Single cyst is observed in 70% of patients. The liver is the most frequently affected organ. The rate of lung involvement is 10-30%. Hydatid cysts in the lungs are multiple in 30% of patients, whereas, they are bilateral in 20%. Additionally, they are located in lower lobe of the right lung in 60% [4,5]. The disease is usually asymptomatic. They can coincidentally be detected in chest x-rays . Dry cough may be the only symptom. Clinical signs are associated with the excessive growth or rupture of the cyst. Cyst rupture may occur due to spontaneous, traumatic or anthelmintic treatment. Chest pain, cough, hemoptysis, urticaria, bronchospasm and anaphylaxis may occur when cysts spread bronchial system. Depending on the size of the membrane which is expectorated, complete tracheal obstruction and sudden death may occur. Cyst expanding to the pleural cavity is a rare but serious complication. In addition, pneumothorax, hydro-pneumothorax and tension pneumothorax may develop . The diagnosis of pulmonary hydatid disease is made by direct radiography and computed tomography. Diagnosis can be provided by round or oval, well-circumscribed, and homogeneous density observation in non-complicated cysts . In ruptured hydatid cyst, the display of the parasite in the microscopic examination of sputum is a diagnostic technique. Magnetic resonance imaging is the method for showing the relationship between the cysts and bronchial tree . The treatment of lung hydatid disease is surgery. Enucleation, cystectomy-capitonnage, and cystotomy-capitonnage are the most commonly used methods . Resection is the other treatment method for cysts that cause severe parenchymal damage, bronchiectasis and bleeding, and include more than 50% of a lobe . In our study, our aim is to compare complicated and noncomplicated hydatid cysts and discuss the characteristics features obtained for both groups in the light of related literature. 85 patients diagnosed with hydatid cyst, admitted in-between 2004-2014 and surgically treated, were investigated. Patients were divided into two groups as complicated and noncomplicated hydatid cyst patients. Complicated hydatid cyst is a ruptured cystic pleural cavity or bronchus. Non-complicated hydatid cyst is an un-ruptured cyst. Patients who had more than one cyst in the same lobe or patients with multiple lung cysts in different locations were excluded in the study as they were thought to change the number and rate and should be examined in different studies. Age, gender, symptoms, vital signs, the type of disease, diagnostic methods, the localization of the disease, surgical technique, complications and duration of hospitalization of the patients were identified. Complicated and non-complicated hydatid cyst patients' distribution and significance according to localization and gender, analysis and significance of complicated hydatid cyst, and surgical treatment and results were evaluated. During statistical analysis, continuous variables were expressed as mean ± standard deviation, and categorical variables were stated as number and percentage. The significance of the results was assessed by Fisher's exact test. P values under 0.05 were considered as significant. The mean age was 24.50 ± 8.29. 46 of them were male (54%), and 39 were female (46%). 58 (68%) of patients had noncomplicated hydatid cysts, 27 (32%) of them suffered from complicated hydatid cysts. 30 (52%) of patients with noncomplicated were male, while 28 (48%) were female. 16 (59%) of patients with complicated were found to be male, whereas 11 (41%) were female. Gender difference was not significant for both groups (p>0.05). Disease was localized in the right lung in 50 (63%) patients, while it was on the left in 35 (37%). In patients with non-complicated, cyst was localized in the right lung in 57% (n=33) patients, while it was in the left lung in 43% (n=25). In complicated cases, cyst was located in the right lung 63% (n=17), whereas it was in the left lung in 37% (n=10). For both groups, the disease was not significant in terms of location (p>0.05). A total of 19 of the lesions in the right lung (38%) were located in the upper, while 3 of them were in the middle (6%), and 28 (56%) existed in the lower lobe. A total of 12 of the lesions in the left lung were in the upper (34%), 1 (%3) was in lingula, and 22 (63%) were located in the lower lobe. Lesions in the right lung in patients with non-complicated cyst were in upper 39% (n=13), in middle 6% (n=2), and in lower lobe 55% (n=18). In complicated cases, the lesions were in upper 35% (n=6), in middle 6% (n=1), and in lower lobe 59% (n=10). Lesions in the left lung in noncomplicated patients were located in upper 36% (n=9), in lingula 4% (n=1), in lower lobe 60% (n=15). In complicated cases, lesions were in upper 30% (n=3), and in lower lobe 70% (n=7). For both groups, the disease was not significant in terms of the location of lobe (p>0.05) (Table 1). Table 1. Distribution localization and gender of patients with hydatid cyst. In gender analysis of the patients with complicated hydatid cyst (n=27), cyst expanded to the bronchus in 11 (69%) (n=16), and into the pleura in 5 (31%) of male patients. On the other hand, cyst expanded to bronchus in eight of (73%) female patients (n=11), and into pleura in 3 (27%) of them. Statistically, gender was found to be not significant on bronchus or pleural expanding (p>0.05). In complicated hydatid cysts (n=27), the right lung upper lobe lesions (n=6) were found to expand to bronchus in 4 (67%), and pleura in 2 (33%). Additionally, one right lung middle lobe lesion (n=1) expanded to bronchus (100%). Finally, the right lung lower lobe lesions (n=10) expanded to bronchus in 7 (70%), and the pleura in 3 (30%). On the other hand, the left lung upper lobe lesions (n=3) were found to expand to bronchus in 2 (67%), and 1 (33%) expanded to the pleura. In addition, the left lung lower lobe lesions (n=7) expanded to bronchus in 5 (71%) and the pleura in 2 (29%). During the statistical analysis, the right lung lesions were found to be significant in terms of the expansion in both bronchus and pleura (p<0.05) (Table 2). Table 2. Analysis of patients with complicated hydatid cyst. When the central and peripheral locations of complicated hydatid cyst were considered, it was found that in 8 (89%) of 9 (33%) patients whose lesions were centrally located, the lesion was seen to expand into the bronchus, and in 1, it expanded to the pleura. On the other hand, in 11 (61%) of 18 (67%) patients whose lesions were peripherally located, the lesion expanded to bronchus, and in 7 (39%), it was found to expand into the pleura. Centrally located lesions were found to be statistically significant in terms of bronchial expansion (p<0.05) (Table 3). +/-: Ruptur positive/ruptur negative; n: Number; %: Percentage. Table 3. Analysis of patients with complicated hydatid cyst. In patients with non-complicated and complicated hydatid cysts, the most common symptom was cough (n=44, 52%). Haemoptysis was seen in 16 (59%) of complicated patients (n=27). 1 patient (4%) with complicated hydatid cysts suffered from shock related to tension pneumothorax (Figure 1). 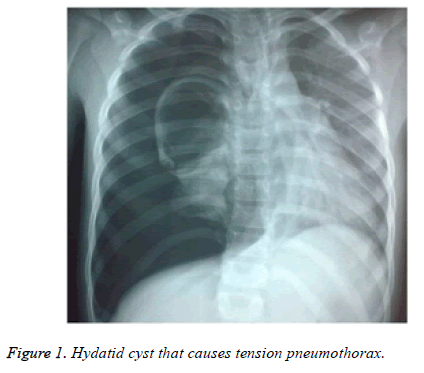 Figure 1: Hydatid cyst that causes tension pneumothorax. Chest x-ray, computed tomography and abdominal ultrasonography were performed to all patients. 53 lesions (62%) were in the lung, 28 (33%) were in lung and liver, 3 (4%) were located in lungs, liver and spleen, and 1 (1%) was localized in lungs and mediastinum. A total of 14 patients (6%) had a cyst larger than 10 cm. 2 of these cysts (20%) expanded to pleura, and 3 (30%) showed expansion to bronchus. Radiologically, in patients with bronchial expansion, air-filled cystic lesions were detected (Figure 2). Loculated pleural fluid accompanying ruptured cyst (empyema) and consolidation existed in 5 of the patients with pleural expansions (62%), hydro-pneumothorax existed in two patients (26%), and tension pneumothorax was detected in 1 patient (12%). 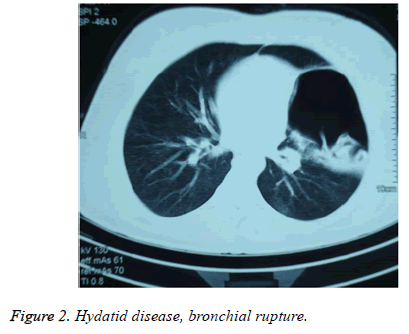 Figure 2: Hydatid disease, bronchial rupture. Tube thoracostomy, thoracotomy and sternotomy were chosen as surgical procedures. 5 patients (19%) with complicated hydatid cyst (n=27) were primarily performed a tube thoracostomy, and then they got thoracotomy. In total, 84 patients were applied thoracotomy; one patient was found to be performed sternotomy due to lung and medisatenal hydatid cyst. Primarily, surgery of the lungs was performed to the patients with hydatid cyst having associated organ diseases. Six patients were operated simultaneously with the right thoracophrenotomy. Sternotomy was made to the patients who were thought to be difficult to reach with thoracotomy. In these patients, cystotomy-capitonnage was applied to cysts in the right upper lobe. 67 patients (79%) were performed cystotomy and capitonnage, and 6 patients with pleural thickening were performed decortication. 18 patients underwent enucleation. Intraoperative, pulmonary arrest and later cardiac arrest developed in a 6-y-old child patient. After the operation, air leaks and expansion defect in three patients, wound infection in 1 patient, opening of capitonnage in 1 patient, and empyema in 1 patient developed. In three patients, air leaks were fixed by repeating thoracotomy. In one patient, incision revision was made. Average length of stay was 8.9 d. Patients were discharged with 10 mg/kg Andazol treatment. Hydatid disease is common in societies where farming is widespread. Eggs of cyst are taken with water and food by humans. Embryos separated from the egg in duodenum settle in the lungs, liver and other organs through the valve port or the lymphatic system. They cause cyst formations by taking the form of larvae in areas where they settle [1,3]. Yazar at al. reported that 14,789 patients with hydatid disease were identified and incidence was found as 6.3/100,000 . Contrary, It was reported a high incidence, 13-27 cases in 100,000, in the Central Asian countries. Furthermore, pulmonary involvement was reported as 10% to 40% . Hydatid cyst consists of three layers and cyst fluid. The first layer is perycist or adventitia layer which is avascular. The other two layers are the ectocyst and germinative layer which is acellular and mucopolysaccharide, or endocyst layer causing the growth of the larvae. Cyst fluid has a clear view including daughter vesicles. Cysts can be isolated to lungs or associated with other organ involvements being intact or ruptured, single or multiple, single-sided or two-sided. In some studies, in terms of organ involvement, liver was reported as %60, lungs were 30%, and other organ involvement was found as 10% . The most commonly affected area is the right lower lobe of the lung. It was followed by left lower, right middle, and the right and left upper lobe [14,15]. In our study, hydatid disease was localized in lungs in 53 patients (62%). Most common organ accompanying to lungs was liver. Furthermore, the most commonly affected areas in lungs were right lower lobe (n=18/10) and left lower lobe (n=15/7) respectively for both non-complicated and complicated cases. No significance was found in terms of localization of the disease being complicated or non-complicated (p>0.05). Dogan et al., in their series with 1055 cases, reported that cysts were located on the right in 60%, and on the left in 38% . Additionally, in 2% of patients, cysts were located in both lungs, and in 7%, multiple lung cysts existed. In our study, the localization of disease in patients with complicated and noncomplicated cysts was found as right lung in 57% and 63% and left lung in 43% and 37%, which is consistent with literature. The right lung or left lung involvement was not significant for both non-complicated and complicated disease (p>0.05). In addition, bronchial expansion was found to be significant in centrally located cysts (p<0.05), pleural expansion was not significant in peripherally located cysts. The most common symptoms are cough and chest pain. Symptoms depend on size of cyst, and its being intact or ruptured. Intact cysts may be detected by chance, or chest pain, shortness of breath and cough. However, if cysts are ruptured to bronchus or pleura, shock may develop resulting from throwing up cyst content, progressive and persistent cough, recurrent haemoptysis, fever, or anaphylaxis. In intact cysts, symptoms are caused by the effects of cyst on organ functions, while, in ruptured cysts, symptoms are more related to hypersensitivity . In our study, the most frequent complaints were cough (52%) and dyspnea (47%). Diagnostic methods are clinical signs, x-ray, computed tomography, ultrasonography, and the detection of specific serum antigens . The most diagnostic symptoms are cyst fluid and membrane expectoration. Round image can be observed in elliptical shape during deep inspiration (Escudero-Nemerow sign). Crescent image can be observed with the entry of air into perivesical and adventitial areas due to severe cough, stress or trauma. This image is an indication of the cyst to be ruptured in a short time. With the entry of air into the membrane of ruptured cyst, the double dome symptoms (double-dome arc) are observed. Lotus image (water lily, camalotte sign) is detected with expectoration of a portion of cyst fluid, and the germinative membrane in the liquid. These are the most common radiological findings. These findings were particularly encountered in complicated cases . Various methods are applied in the cyst surgery such as opening a pericystic, removal of the cyst contents without being ruptured and capitonnage technique (Barrett technique) identified by Barrett and Thomas in 1952. Perez Fontana technique is a cavity wall resection method. However, this technique is a method leading to complications that cause air leakage. On the other hand, the Ugon method is a technique used in cysts which are small, and do not possess the risk of rupture [18,19]. In some studies, the thoracoscopic procedures for the treatment of pulmonary hydatid disease have been reported to be used successfully. The biggest advantage of this procedure has been explained as patient comfort and less trauma as in other thoracoscopic procedures . Segmentectomy and lobectomy can be applied if bronchiectasis, severe inflammation and ruined parenchyma exist. If right lung hydatid cyst accompanying liver hydatid cyst exist, thoracic diaphragmatic approach is applied. The preferred method of bilateral lung cysts is single-stage median sternotomy or two-stage thoracotomy, in which larger cysts are operated first . Medical treatment is recommended for patients for whom surgical approach is not deemed appropriate, who have major vascular involvements, and many small cysts involving one or more organs . In our study, 5 patients (19%) with complicated hydatid cyst were first applied tube thoracostomy and thoracotomy was provided after clinical relief. A total of 84 patients underwent thoracotomy and 1 patient was performed sternotomy because it was difficult to reach due to lung and mediastinal hydatid cyst. In surgeries, standard posterolateral thoracotomy incision was used. 6 patients were performed lung and liver cyst surgery simultaneously with right thoracophrenotomy. 67 patients (79%) were performed cystotomy and capitonnage, while 6 patients with pleural thickening were performed additional decortication process, and 18 patients underwent enucleation. While none of the patients were in need of resection. It was reported that morbidity rate of hydatid cysts in the lungs after surgery was 1.4-19.1%, and mortality rate was 0.6-4.2% [9,22]. No mortality was encountered in our patients. However, respiratory and cardiac arrest developed in an intraoperative child patient with the opening of cyst content into bronchus and trachea because bronchial blockade could not to be able to conducted due to lack of technical equipment. The operation was done in the patient responding to intraoperative resuscitation. The patient was successfully discharged. Three patients had prolonged air leak and expansion defect, 1 patient developed wound infection, 1 patient suffered opening of capitonnage, and 1 patient developed empyema. Those patients, re-operated and treated in an appropriate manner, were successfully discharged. Consequently, hydatid disease is particularly common in places where farming is still widespread. We believe that the only treatment method is people's awareness and surgical procedures. AD conceived the study, collected the data, performed the statistical analysis and drafted the manuscript. AD, BO, and MC participated in the design of the study, data collection and drafting the manuscript. All authors have read and approved the final manuscript. We would like to thank all the physicians and service staff who helped in the collection of data. This study was not funded by any department. Aletras H, Symbas PN. Hydatid disease of the lung. Lippincott & Wilkins, Philadelphia, USA 2000; 1113-1122. Yuksel M, Balcı AE. Göğüs Cerrahisi Kırmızı Kitap, ikinci baskı. İstanbul: Nobel Tıp Kitabevleri 2015. Tiryaki T, Şenel E, Akbıyık F, Mambet E, Livanelioğlu Z, Atayurt H. Kist hidatik hastalıklı çocuklarda on yıllık deneyimimiz. Türkiye Çocuk Hast Derg 2008; 2: 5-10. Morar R, Feldman C. Pulmonary echinococcosis. Eur Respir J 2003; 21: 1069-1077. Pedrosa I, Saiz A, Arrazola J, Ferreiros J, Pedrosa CS. Hydatid disease: radiologic and pathologic features and complications. Radiographics 2000; 20: 795-817. Agganval P, Wali JP, Albendazol in the treatment of pulmonary echinococcosis. Thorax 1991; 46: 599-600. Ökten I, Kavukçu HŞ. Göğüs Cerrahisi. İstanbul: İstanbul kitap evi 2013. Sahin E, Enon S, Cangir AK, Kutlay H, Kavukcu S, Akay H. Single-stage transthoracic approach for right lung and liver hydatid disease. J Thorac Cardiovasc Surg 2003; 126: 769-773. Kavukcu S, Kılıc D, Tokat AO, Kutlay H, Cangır AK, Enon S. Parenchyma-preserving surgery in the management of pulmonary hydatid cysts. J Invest Surg 2006; 19: 61-68. Altay SA, Selcuk ZT, Kalyoncu AF, Coplu L, Emri S. Treatment of Echinococcus granulosus cysts. Scand J İnfect Dis 1993; 25: 269-274. Yazar S, Ozkan AT, Hokelek M, Polat E, Yilmaz H, Ozbilge H. Cystic echinococcosis in Turkey from 2001-2005. Turkiye Parazitol Derg 2008; 32: 208-220. Fraser RS, Muller NL, Coleman N, Pare PD. Protozoa, helminths, arthopods and leeches. In: Fraser and Pare’s Diagnosis of diseases of the chest (4th Ed.). WB Saunders, Philadelphia, USA 1999; 1033-1066. Ihsan A. Thoracic hydatid cyst: clinical presentation, radiological features and surgical treatment. Principles Pract Cardiothorac Surg 195-217. Beggs I. The radiology of hydatid diseases. AJR 1985; 145: 639-648. Göçmen M, Toppare F, Kiper N. Treatment of hydatid diseases in childhood with mebendazole. Eur Respir J 1993; 6: 253-257. Dogan R, Yuksel M, Cetin G, Suzer K, Alp M, Kaya S. Surgical treatment of hydatid cysts of the lung: report on 1055 patients. Thorax 1989; 44: 192-199. Dhaliwal RS, Kalkat MS. One-stage surgical procedure for bilateral lung and liver hydatid cysts. Ann Thorac Surg 1997; 64: 338-341. Anadol D, Gocmen A, Kiper N, Ozcelik U. Hydatid disease in childhood: a retrospective analysis of 376 cases. Pediatr Pulmonol 1998; 26: 190-196. Safioleas M, Misiakos EP, Dosios T. Surgical treatment for lung hydatid disease. World J Surg 1999; 23: 1181-1185. Mallick MS, Al-Qahtani A, Al-Saadi MM, Al-Boukai AA. Thoracoscopic treatment of pulmonary hydatid cyst in a child. J Pediatr Surg 2005; 40: 35-37. Stamatakos M, Sargedi C, Stefanaki Ch, Safioleas C, Matthaiopoulou I, Safioleas M. Anthelminthic treatment: an adjuvant therapeutic strategy against Echinococcus granulosus. Parasitol Int 2009; 58: 115-120. Balcı AE, Eren N, Eren Ş, ve ark. Akciğer Kist Hidatiği: 728 Olgunun Cerrahi Tedavi ve İzlemi. Solunum Hastalıkları 2001; 12: 216-221.